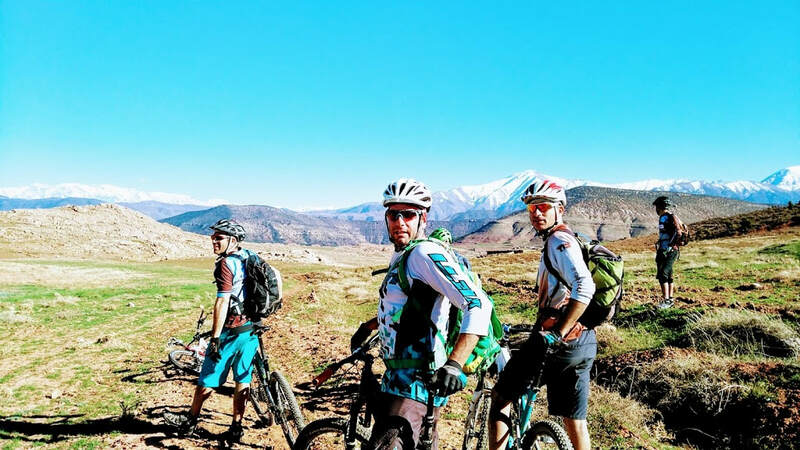 A wonderful 8 day biking tour across the Atlas Mountain to the Sahara Desert, the wonderful way to explore Morocco, start cycling from the High Atlas and ending in the Deep Sahara Desert, biking through ancient Kasbah and Berber villages, with a lovely two day biking in Sahara. 2nd DAY: MARRAKECH – ATLAS MOUNTAIN – OUARZAZATE. Departure from Marrakech by (4×4 Toyota Land Cruiser), crossing the Tichka Pass (2260m), stop for lunch in Ait Ben Haddou village, start cycling to Ouarzazate city, 30 km. 3rd DAY: OUARZAZAT – CASCAD TIZQUI – M’EZGUITA OASIS. 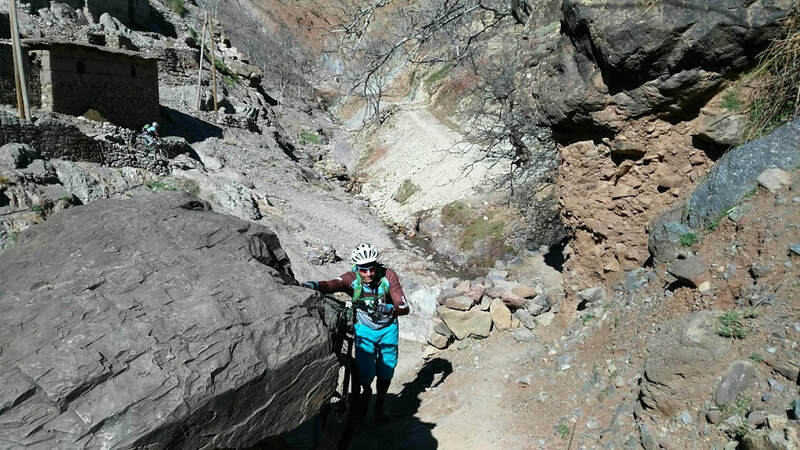 After breakfast, start driving by car for 1 hour, to Pass Tinifift, cycling from the pass enjoying a long descent to Tizqui waterfall, green oasis surrounded by volcanic Mountains, overnight in Kasbah + swimingpool. 4rd DAY: M’EZGUITA OASIS – DRAA VALLEY – ERG LIHODI (SAHARA DESERT). Cycling deep into the south Moroccan, to Zagora city gateway to Sahara Desert, through the spectacular Draa valley, longest valley in morocco 1200km, and largest date palm oasis in North Africa. Overnight in Desert Camp. 5fth DAY: ERG LIHODI – CHEGAG DUNES. After breakfast, our day begins with short drive 20 minutes. We leave the sund dunes of Erg Lihodo to reach to fast and following tracks that head west to the big dunes of Chigaga. Lunch will be in sacred oasis called Oum El Alg. Overnight in Camp, enjoy a typical night under stars. 6th DAY: CHEGAGA DUNES – FOUM ZGUIDE – TAZNAKHT. After enjoying the sunrise moments and walking in the sand dunes, we start cycling through the old PARIS-DAKAR Road, to Fom Zguid, via the dry lake Iriki, lunch in Foum Zguid city, overnight in hotel + swinmingopoll in taznakht town. 7th DAY: TAZNAKHT – TICHKA PASS – MARRAKECH. After breakfast drive back to Marrakech across Tichka pass (2260m), arrival in the late afternoon, check into your hotel or Raid, with an overstay night and breakfast. The after-noon will bring an opportunity to visit some monuments, souks, or simply relax by the pool. 8th DAY: MARRAKECH – AIRPORT. Ancient city of Marrakech, souks and palace. 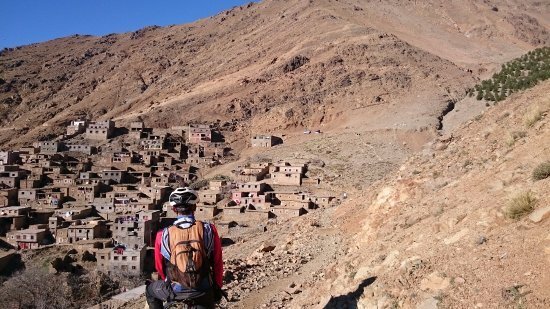 Spend a week Mountain biking in the south Moroccan. Ancient Kasbah and Berber villages. Experience the life style of the Nomad people. 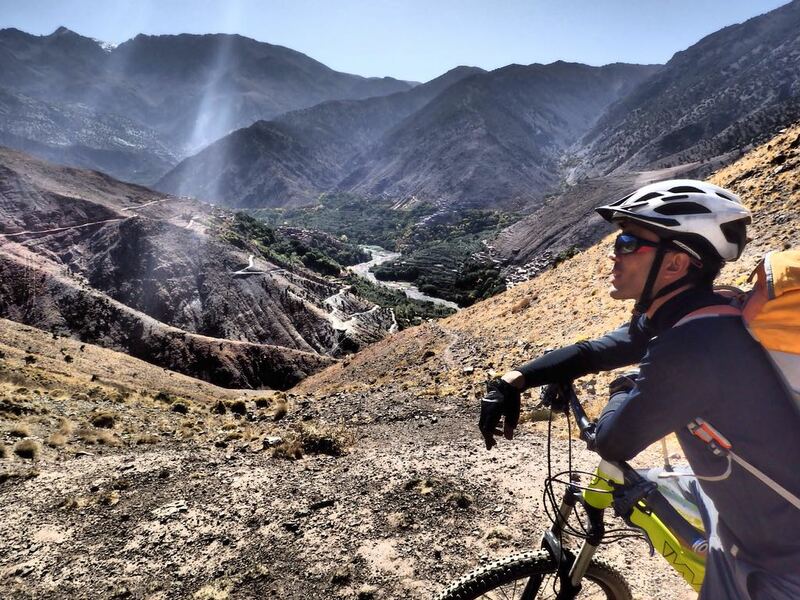 Biking across High Atlas Mountain to Sahara Desert. Spend two nights in camp under stars in Sahara Desert. BIKE DISTANCE DURING THE WEEK: 300 KM. LODGING: Hotel / Guest house / Nomadic camp. GROUP SIZE: From 3 persons. 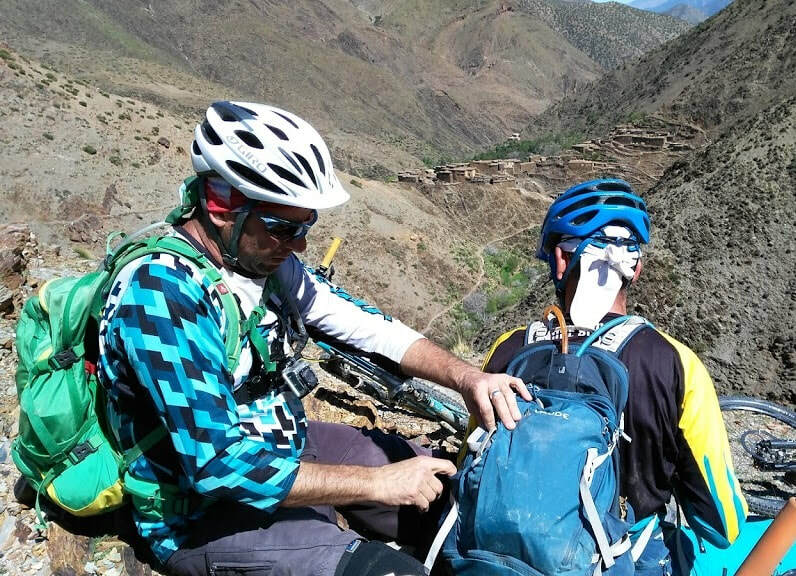 MEALS PLAN: All meals are included during our Mountain biking tour except diner and lunch in Marrakech. TRANSPORT: 4X4 Toyota land cruiser for assistance during the Mountain bike tour. STARTING FINISHING POINT: Marrakech to Marrakech. CYCLE RENTAL: If you want to use your own bike it is usually easy to find flights which are suitable and we will send you our guideline packing instructions. If you prefer to rent one we have bikes in Morocco, these are constantly changing and being updated so contact us for latest rental information. High quality Mountain biking: full or front suspension. Guide <Local guide with our Moroccan tour Leader>. Cook < Professional cook in the whole tour>. Food < Lunches - Diners - Breakfast>. Transport < Two 4x4 cars Assistance>. ​Nights < 6 nights in the Guesthouses>. ​Bikes (you can hire it from our shop.). A well maintained mountain bike. You won't need to carry tools, a trail side repair kit or a first aid kit as your coach/guide will have all of this.